The Prospector Mini Recirculating Highbanker was designed to help you get the gold much faster than panning or drywashing. 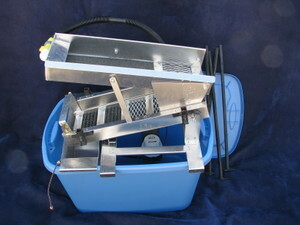 This highbanker comes in a tub with a 12 volt 800-gph pump for plenty of water volume, 4 foot recirculating hose, a recirculating pump bracket, a set of adjustable legs so you can use it off the tub in a stream, gravel catch, and black ribbed matting for fast gold ID, and ribbed miner's carpet. This unit fits in a 18 gallon plastic tub that is also included. The sluice and hopper make 40" of classifying area. The box and hopper are 6"W x 20"L x 3 inch high sides. Made of strong .080 gauge 5052 aircraft aluminum. The benefit of aluminum is that it is easier to use a magnet to remove the black sand build up, and it's lighter weight. The riffle cage is also aluminum. All you need to buy is a 12V lawn mower battery. You can use the Prospector Mini Recirculating Highbanker in the desert or your favorite stream. Hand crafted here in the USA!